"So sorry for your families loss Brian. You and your entire family are in my thou"
"We are so sorry for your loss. May God comfort you during this time." "Burnice, Brian, Preston and Family. I will miss Wendell so much and if there is "
Wendell L. Wilkie, 76, of Dawsonville passed away Tuesday April 18, 2017 at Northside Forsyth Hospital following a sudden illness. Born October 7, 1940 in Pickens County to the late Garnie and Clifford Wilkie, he had lived in Dawson County for over 50 years. A devoted husband, father and grandfather, Wendell was involved in several business adventures. He was a very devoted Christian and was a member of Juno Baptist Church. Wendell was also preceded in death by his sister, Ramona Wilkie, and a brother, Neil Wilkie. 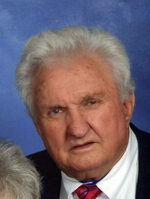 Surviving are his wife of 55 years, Bernice Wilkie, Dawsonville; sons and daughters in law, Brian and Mary Ann Wilkie, Winder, Preston and Misty Wilkie, Dawsonville; grandchildren, Eli, Sadie, Adley, Michal, Chloe, Achan; and a number of other relatives. Funeral services will be held Friday April 21, 2017 at 2 o’clock at Juno Baptist Church with the remains placed in state at 1 o’clock. Rev. Brody Hughes, Rev. Tim Biddy, Rev. Dennis Bottoms and Rev. Tommy Weldy will officiate. Interment will follow in the church cemetery. The family will receive friends Thursday from 1 until 8 at the funeral home. In lieu of flowers donations may be made to Juno Baptist Church.